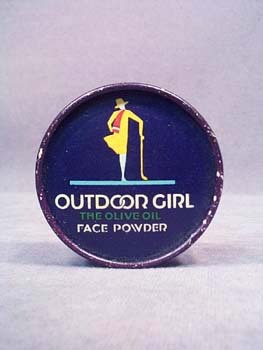 Crystal Laboratories of New York made Outdoor Girl, the olive oil face powder. Text on the bottom indicates that the flesh-toned powder originally contained in the heavy paper box was unconditionally guaranteed, emphasizing its benefits to the skin. A 1929 patent date also appears on the back. The top features a stylish woman in colorful outerwear. There is a tack hole on the back with worn paper surrounding it, and minor wear to the top edge as seen in the photo. This terrific face powder box has beautifully withstood its 70-year existence!